Evolution is one of the greatest scientific discoveries of all time. Armed with the knowledge of the interconnectedness of all life on earth, biologists have made startling discoveries. There is so much evidence in favor of evolution, that arguing against it is like denying that there is a moon in the sky. Yet people do still actively deny evolution occurs. Speciation, the formation of a new species from an ancestor species, takes a very long time yet there are evolutionary steps which can be observed. Here are eight examples, amongst many, of evolution in action. I’ll start this list with a classic example of evolution which can be found in many textbooks. Originally, the vast majority of peppered moths (Biston betularia) had a light, mottled coloring which was a good camouflage against predators. Before the industrial revolution, a uniformly dark variant of the peppered moth made up 2% of the species. After the industrial revolution, 95% of peppered moths showed this dark coloration. The best explanation as to why this change in the species occurred is that the light moths lost their advantage of camouflage as light surfaces were darkened by pollution, and so light moths were eaten more frequently by birds. 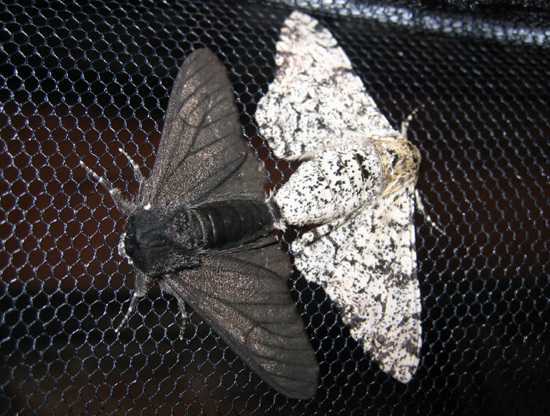 The peppered moth as an example of evolution has been attacked recently, usually as to the cause of the shift in coloration, but the example still stands as a major shift in a species caused by mutations leading to variation and natural selection. The example of the peppered moth is a nice one for textbooks because it uses a single trait. Speciation involves many mutations leading to significant changes. 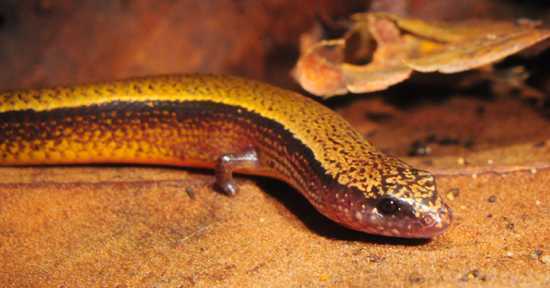 The yellow bellied three-toed skink (Saiphos equalis) is a lizard of New South Wales, in Australia, that appears to be undergoing the change from laying eggs to live birth. Since these skinks can either lay eggs or give birth, it gives scientists the chance to study the adaptations necessary for live birth. Skink embryos encased in an egg have an extra source of calcium that the live born skinks lack. It turns out that this nutritional difference is made up by the mother secreting extra calcium for the young held inside her. This looks like the first step on the road to developing a system like the mammalian placenta. Skinks living on the coast tend to lay eggs, probably because the warm weather is predictable and sufficient for embryonic development. Those skinks living in the cooler mountains tend to give birth to live young, the mother’s body providing a more stable temperature. It is to be predicted that these two populations will at some point separate into different species as each population becomes fixed in its reproductive strategy. This brings up a common question in creationists – If man evolved from apes, why are there still apes? Well, with the skinks we would see two species formed, an egg laying and a live birthing species. Each would be best suited for their habitat. If live birthing skinks evolved from egg layers, why are there still egg layers? Because each is adapted for its niche. Evolution often happens in tandem; a predator evolves an improved hunting method, and any mutations in the prey species that aid survivability will be selected for leading to a change in the prey population. We do not have to wait for a predator to evolve to observe this, however; modern humans have been transporting species around the world, and thus we can observe new species interactions. The Asian shore crab (Hemigrapsus sanguineus) is an invasive species in New England which feeds on the native blue mussels. It has recently been observed that mussels, when they detect Asian shore crabs, develop thicker shells to stop the crabs eating them. This shell thickening behavior is costly to the mussels, and so is heavily regulated. The evolutionary factor here is that only mussels from regions where Asian shore crabs are endemic will thicken their walls when exposed to the crabs. 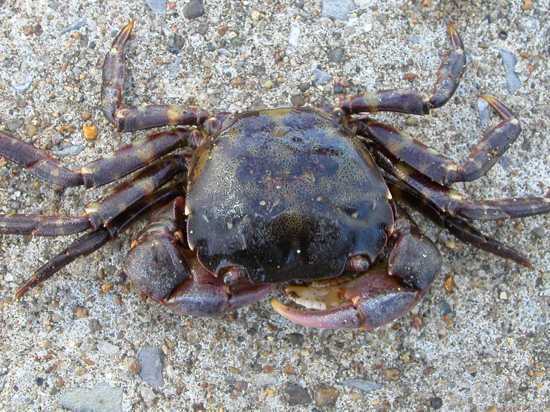 Those mussels from other regions do not detect the crabs as a threat. Here we observe the starting shots in an evolutionary arms race. 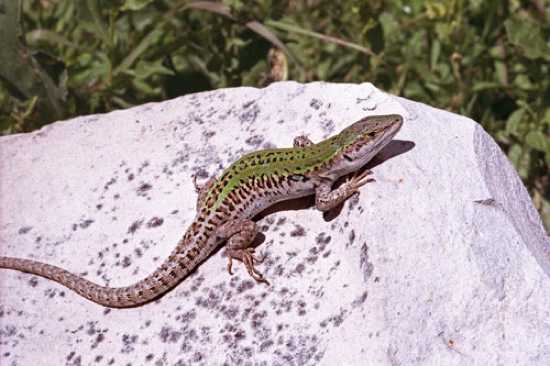 In 1971, ten Italian wall lizards (Podarcis sicula) were introduced to the island of Pod Mrčaru from a neighboring island. The lizards were left for decades, and compared to the colony from which they were taken. The wall lizards on Pod Mrčaru, having passed through a tiny genetic bottleneck, were found to have thrived and adapted to their new island. They were found to have shifted from a mainly insectivorous diet to one heavy in vegetation. This diet change seems to have driven dramatic changes in the lizards. The head of the Pod Mrčaru lizards is larger, and has a far greater bite force. These are key adaptations for dealing with chewing leaves. The most exciting sign of evolution is the development of cecal valves, muscles used to separate portions of the intestine. These serve to slow the passage of food through the intestine and give time for the bacteria in the gut to breakdown the plant matter for absorption. This is an entirely novel development in the Italian wall lizard, and a major adaptation. The cane toad in Australia is probably one of the world’s most famous invasive species. It does immense harm to agriculture and native species. Australia is big, for those who don’t know, and it takes time for an invasive species to spread. Those toads at the front of the invasion wave are likely those best adapted for spreading fastest. Of course, these fast-spreading toads will breed with each other as only other fast toads will be at the front. This is charmingly called ‘the Olympic village effect’ and will reinforce the adaptations which put these toads at the front. When toads at the front of the invasion wave were studied, they were found to be bigger, hardier, had longer legs allowing for greater speed, and were more active. As a result of these sorts of adaptations the rate at which cane toads spread has been increasing ever since they were introduced. This is not going to be a simple recap of Darwin’s original observations of adaptation amongst the finches of the Galapagos. These finches are still helping evolution be understood. 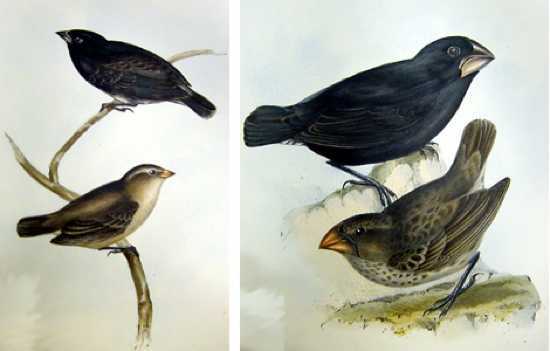 Peter and Rosemary Grant studied the finches on one of the Galapagos Islands, and have observed evolutionary change caused by direct competition of two rival species. The medium ground finch was well established on the isle of Daphne, and had been studied in depth. Its beak was suited perfectly for cracking large nuts. In 1982, the large ground finch from a neighboring island arrived. These larger finches could drive away the native medium ground finches and would eat all the large nuts. Over the period of study, the medium ground finches of Daphne island were found to have developed smaller beaks more suited to the smaller nuts, ignored by the invading larger finches. This is a classic study in evolutionary biology. Studying evolution can take decades, but occasionally change happens incredibly rapidly. 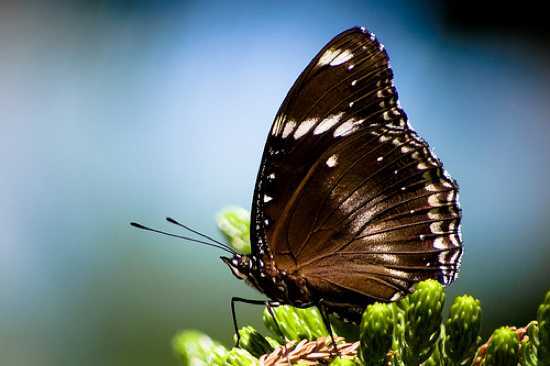 The Blue Moon Butterfly (Hypolimnas bolina) of the Samoan islands was being attacked by a parasite which destroyed male embryos. This led to a gender imbalance whereby males made up only 1% of the butterfly population. However, within ten generations (~1 year) males had returned to 40% of the population. This is not because the parasite has disappeared, it is still present, but it is no longer deadly to male embryos. This case shows how a mutation giving an advantage can rapidly spread throughout a population. Any male with the ability to survive infection would be able to mate with a great many females, due to the paucity of other males, and spread his immunity through the gene pool. As the huge array of drug resistant pathogens grows we are learning that evolution is easiest to observe in species with a quick generation turnover. 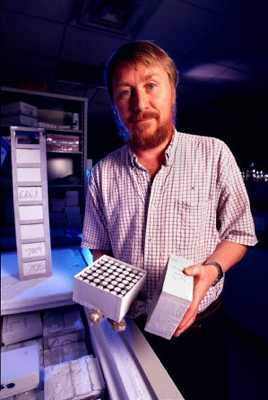 Since 1988, in the lab of Richard Lenski, the evolution of twelve E. coli populations from a single ancestor strain has been studied. Since then, over 50,000 generations of E. coli have been and gone, and the differences between the populations and each population from the ancestor strain have been documented. With samples of each population taken regularly the accumulated genetic changes can be followed with ease. Over time the bacteria have become far more efficient at growing under the conditions used. This study has provided evidence of how evolution actually occurs. One of the populations developed the ability to utilize citrate as a nutrient, something otherwise unknown in E. coli under similar conditions. “Life Evolves!” This quote is from a brilliant letter Lenski wrote to a particularly odious creationist. The series of letters can be found here.